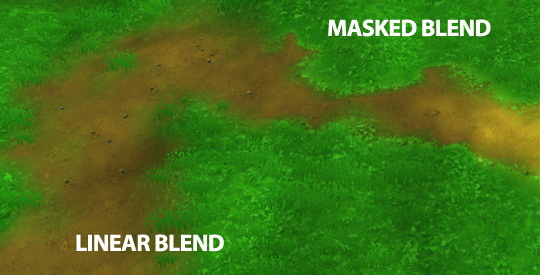 Radiator Blog: Hacking blend transition masks into the Unity terrain shader. Hacking blend transition masks into the Unity terrain shader. It is a truth, universally acknowledged, that grass rarely fades linearly into dirt. Grass is often quite clumpy. I wasn't satisfied with the non-clumpiness of my grass in a certain project, so I hacked Unity's terrain shader to add some blend mask support. You could probably use this technique for cobblestones, bricks, debris, gold coins... whatever you want to remain clumpy when overlaid on top of another texture. You have a control texture that gets projected over your terrain, like a typical terrain heightmap. The four channels (RGBA) of that texture each correspond to a separate entry in the terrain paint palette. In the control texture, Red is the first texture you define in the terrain tool, Green is the second, Blue is the third, and Alpha is the fourth. 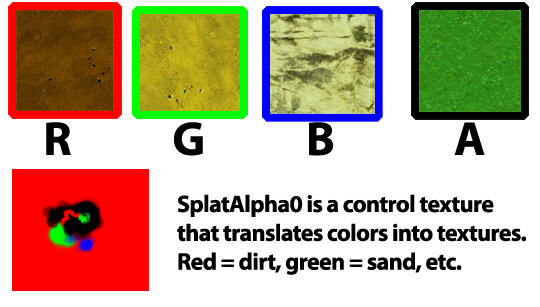 When you paint some dirt, you're actually painting red or green or blue or alpha onto this control texture. Then the shader takes over. It applies your dirt texture based on how much red it sees at a particular coordinate. Then, it overlays your second texture (some sand?) based on how much green is in the control texture, etc. and so on. For convenience, I use the fourth texture slot for whatever I want to clump -- in this case, the fourth texture is my grass texture. In the shader code below, Line 38 is where all the magic happens. I tell the terrain shader to look at how much "alpha" is in the control texture. When there's a little, it won't overlay anything. 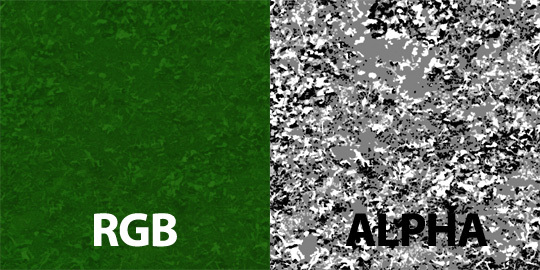 But when there's a lot of alpha, it will modulate itself with the strength of the mask in the grass texture's alpha channel, and then delete some of the first three layers -- that's so we can get really clean but smoothed transitions when we replace those deleted pixels with fresh grass clumps. One really important note: I could've used an "if( )" statement to detect whether the alpha value of the control texture was above a certain threshold or not -- and if so, then override that pixel with the grass clump no matter what. That would've been really simple and fairly tunable. In general, I could probably improve upon this implementation a lot, but I've already tuned the numbers to suit my particular needs. As far as I'm concerned, this effect is done and I'm going to move on with the rest of the game. I'd suggest a similar attitude for your own projects -- this is just a small piece of your game, don't obsess too much over one piece of one shader. Paste my code into your project, tweak the numbers, and move on. Nostrum update: now with a map!